Home » Congratulations to our 2018 Maddox Award winners! Congratulations to Kahli Zietlow, MD (Advanced Geriatrics Training Program), and Kendra Seaman, PhD (Postdoctoral Scholar), the latest recipients of our annual Maddox awards. The awards are to support the academic endeavors of young and aspiring investigators. 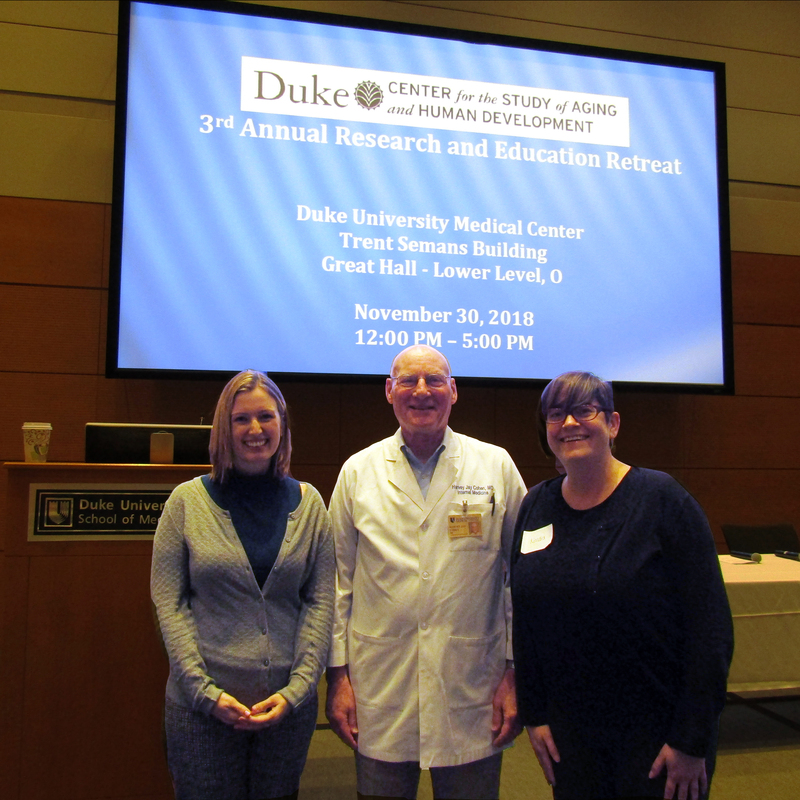 2018 Maddox Award Recipients Kahli Zietlow (Left) and Kendra Seaman (Right) with Center Director Dr. Cohen (Center). My project is a pilot study to describe the prevalence of cognitive impairment, incapacity and their relationship in older adults presenting for elective surgery. Older adults have a high burden of cognitive impairment, which is correlated with impaired capacity to consent for medical-decision-making. This presents challenges when considering how best to consent older adults for surgery. There is a paucity of literature exploring how capacity is approached in the preoperative setting. Formal assessment is time-consuming and not feasible to perform on all patients in a busy preoperative clinic. Perioperative Optimization of Senior Health (POSH) is an integrated care model between surgery, anesthesia, and geriatrics. Patients presenting for POSH pre-operative appointments are eligible for inclusion. Participants will undergo cognitive testing with the MOCA and Independent Living Scale (ILS). The ILS primarily assesses executive function and judgement. Capacity to consent for upcoming surgery will be assessed using the MacArthur Competence Assessment Tool for Treatment (MacCAT-T). The MacCAT-T evaluates ability to understand, appreciate, reason, and express a choice, to aid clinicians in making a capacity determination. Based on results, we hope to identify cut scores for these instruments to understand when a more thorough capacity assessment is indicated. Recent research has shown that compared to younger adults, older adults have a tendency to accept more positively-skewed risks (small chance of a large gain) than other types of equivalent monetary gambles. We call this propensity an age-related positive-skew bias. However, it is unclear whether these results generalized to decisions about other, non-monetary risks. Specifically, do older adults display an age-related positive-skew bias when considering health-related risks? I will use the Maddox awards to plan and conduct pilot studies examining this question. The award will be used to fund a visit to work in the laboratory of Corinna Löckenhoff, an expert in aging and health-related decision making. The goal of this visit to Cornell University will be to adapt existing financial decision-making tasks into the health domain. Remaining funds will be used to collect pilot data for a grant on health-related incentive processing and decision making.